The tensions between a procedural medical drama and a slasher film are placed terminally at odds in Mike Hodges’ The Terminal Man. This oddly structured movie is based on a novel by Michael Crichton. Unfortunately, it never establishes a consistent tone, ensuring that it will leave audiences seeking either an intellectual investigation of medical ethics or a thrilling hunt for a serial killer feeling somewhat unsatisfied. Starring George Segal as Harry Benson, a brilliant scientist whose brain turns him into a sociopath for a few minutes each day, this speculative work hypothesizes about what might happen should man begin to merge with machine. The Terminal Man is divided into two distinct halves. The first act details the lead up to and execution of Benson’s pioneering operation. In a sterile hospital setting, doctors quickly debate about the moral implications of installing a computer into a man’s brain while we see Benson interrogated about his condition. Cinematographer Richard H. Kline’s camera glides gracefully around the sterile medical environment, shooting what must have been a state-of-the-art facility as if it were a sci-fi futurescape. The surgery itself, when it arrives, is played out with excruciating attention to detail. This all seems to be only half as fascinating as it should be. The sheer amount of screen time devoted to rote exposition here is galling because it never seems to be working toward any specific end. While there is some nice moment to moment detail about the practices of a contemporary hospital, it accumulates for its own sake. The technical jargon bandied about seems somewhat restrained, the ethical debates are somewhat half-hearted, and the patient’s dilemma feels somewhat academic (manipulative as it might be, the drama would be better served had he a long-suffering wife or child). After the operation, The Terminal Man quickly shifts gears. Benson’s cure inevitably goes awry, increasing the frequency of his psychotic outbreaks. He flees the medical facility and a manhunt begins. This set-up initially seems to promise great thrills and justify the slow-burn of the opening act, but Hodges continues to minimize audience involvement. While Segal is surprisingly effective in his barely sketched role, his rampage is sedate by any standard. What is disappointing is that Hodges seems to approach his plight clinically, like a case study, focusing more on the interactions between the police and the medical staff than Benson. 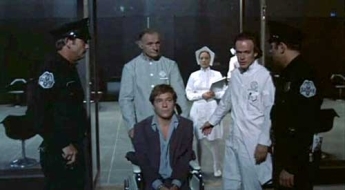 By the time The Terminal Man reaches its tragic ending, it has succeeded in the dubious achievement of making us view its subject as dispassionately as any clinician.